Your kids will love learning about the solar system with this fun and interactive Solar System educational cloth wall hanging. The movable puffy pieces, each colorfully screen printed with neatly embroidered edges, include all 8 planets (Mercury, Venus, Earth, Mars, Jupiter, Saturn, Uranus, and Neptune), two satellites, a shuttle, a rocket, and even an alien space ship. Also beautifully embroidered are stars, the SOLAR SYSTEM heading, the orbiting paths, and the name of each planet on the corresponding orbit path. 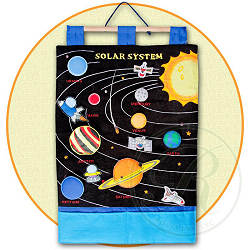 With a "roped" wooden dowel for easy and straight hanging and pockets at the bottom for storing the removable pieces, teaching kids about the solar system will be an interactive delight with this Solar System fabric wall hanging.